The center opened in 1968 for older adults and has continued to grow to meet the ever-changing needs of those whom we serve. Membership is available to those who are 55 years of age and older. The yearly fee is $20.00. 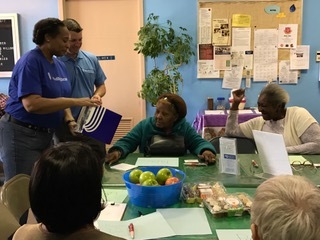 Members of our Senior Center located at 102 W. 5th Street, can be sighted on Tuesdays and Thursdays busily crafting their signature “Tag Craft Bags”. These unique, one of a kind handbags are constructed primarily with donated can tabs. Parachute cords of various colors are used to bind and thread through the bags. A standard sized handbag is approximately 11 by 9 inches with a strap length of 28 inches. It takes a whopping 1,500 can tabs and 75 to 100 feet of parachute chord to complete a standard sized handbag. Bags cost only $65 and proceeds go directly toward the Center. Not to mention, these bags would make a perfect gift for the holidays! Interested parties may select from our current stock of different sized and colored bags or make a special request for their desired, custom-made style. They can be purchased in person by cash or check.